The Roll-Up #52: Do Lobsters Get High? This week: Ben returns from the Boston Freedom Rally, Coke courts a cannabis company, weed bales wash up in Florida, and Mainers treat lobsters to some fine local product. What’s this show? Every Friday, Leafly editors Bruce Barcott, Ben Adlin, and Dave Schmader dissect the week’s top stories in cannabis with analysis, arguments, jokes, and obscure cultural references. Boston Freedom Rally Rocks: Ben Adlin reports from the Northeast’s premiere hempfest. Heritage Cannabis: David Downs’ 3-part guide to finding cannabis from verified California heritage cannabis farms will connect you to some of NorCal’s finest product. Coke-n-Cannabis: Will the soda giant really create a CBD cola? Essential Tremor and CBD: Could cannabidiol be a calming drug for those suffering from this condition? Florence Taketh & Giveth: Tropical storm Florence upset some cannabis smuggling operations and sent a whole lot of hay-baled product afloat. Result: Florida beachgoers caught themselves some square groupers. 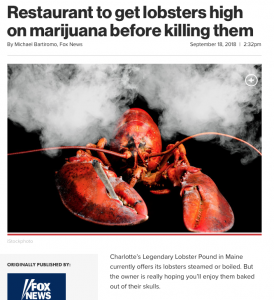 In the restaurant’s first experiment into the process, a lobster — nicknamed “Roscoe” — was placed into a box with a few inches of water at the bottom and marijuana smoke was then blown through the water, into the box. Maybe not so many nug shots? Okay so we were all set to link y’all to Joe Santos, @joesant13970505, and we gave him a shoutout on this week’s episode. He really does have some glorious nug shots on his scroll. But then this morning we went to find the link and this is what popped up. 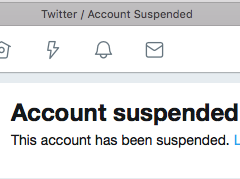 Not sure if this is related to the cannabis, but you may have to wait a while to appraise Joe’s curated tweets.